Browse through our small villas in Tuscany & Umbria. Click on the image of a house to discover more about each rental property. Larger houses are at the bottom, we have included some houses that can sleep up to 8 people because they can also be rented by smaller parties. We are here to help you find the perfect villa for your holiday in Tuscany and Umbria, Italy. If you can’t decide or don’t have time to browse, please use our filtered search to Find A Villa. Or send us an enquiry with the size of your party and your preferred dates and any other requirements you might have. 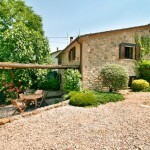 We’ll send links to our suitable rental villas on the Tuscan Umbrian border. La Fontanina is a one bedroom holiday cottage ideal for honeymoons and romantic getaways. Located high above the beautiful Niccone Valley on the Tuscany Umbria border, it is close to the village of Spedalicchio and the towns of Umbertide, Città di Castello, Trestina and Montone. Casa Bella has a large pool, tennis court, hot tub, pizza oven and a high quality, spacious interior. The property has marvellous views across Lake Trasimeno. 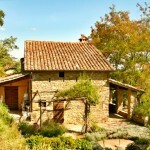 Casa Ospicchio is a small villa on the Tuscany Umbria border. An old schoolhouse with beautiful modern interior and stunning views. Casa Sant’Anna is on the edge of a hamlet above the Niccone Valley. Stylishly furnished, it is ideal for a small family or couples. There are lovely views across the hills and valleys below. Casa Gorgacce is perfect for a family holiday in Italy. It is a short drive to villages with restaurants, bars and shops and has a fenced pool with thermal cover. Casa del Lupo is a beautiful holiday villa in a valley called the Pian di Marte, located on the edge of a hamlet called Val di Rosa, it is close to the villages of Lisciano Niccone, Mercatale di Cortona and Castel Rigone. 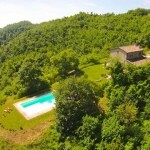 It has incredible views across the Tuscany Umbria border and a fenced, solar heated pool with thermal cover. La Rondinaia is a lovely villa located in the Umbrian countryside between Pietralunga and Città di Castello. This old farmhouse has been beautifully restored and equipped with every modern comfort. Villa Forconi is a beautiful villa restored to the highest standard. The interior is extremely spacious and luxurious and the views along the Niccone Valley stretch to the Apennine mountains. This villa offers luxurious accommodation at a very ordinary price. Villa Padrone is a luxury holiday home with incredible views over Lake Trasimeno. The house has a modern interior which uses reclaimed and new materials to create a finish of the highest standard. The infinity edge of the pool merges into the view of the Lake below.